Through five games of the 2018 NFL season, Derek Carr was in a bad spot. He had thrown seven touchdowns and eight interceptions — at one point pacing the league in the worst stat possible. In the meantime, the team around him continued to crumble — spiraling towards a mandatory rebuild with almost no hope in sight. As the trade deadline neared, the conversation around Carr picked up. Might the Oakland Raiders move on from their quarterback? Was Carr not the guy they thought he was when he signed a max extension? Could they even get anything in return for him? Well, while the team continued to spiral downwards, it appears that all the voices got to Carr because since Oct. 7, Carr has thrown nine touchdowns and zero interceptions — throwing 227 passes since his last interception. For context, only Aaron Rodgers has a longer streak going — of eight games and 307 attempts without an interception. But it’s not just his ability to stop turning the ball over that has changed — this season, Carr is completing passes at a higher rate than any season in his career. Heading into the season, his best completion percentage was 63.8 (from his brilliant 2016 season) — this season? He’s completing 69.2 percent of his passes. And again: it’s not just that he’s completing a higher percentage of passes, but his yards-per-completion has increased as well! In 2016, his yards per completion was a career-high 7.03 — this season? 7.37. And he’s doing all this despite playing behind an offensive line that has allowed the fifth-most sacks in the league (39) and with a receiving corps that is well below league average. With a new coaching staff and another new offense on the docket for this season, it was reasonable to expect that there would be some growing pains for Carr. 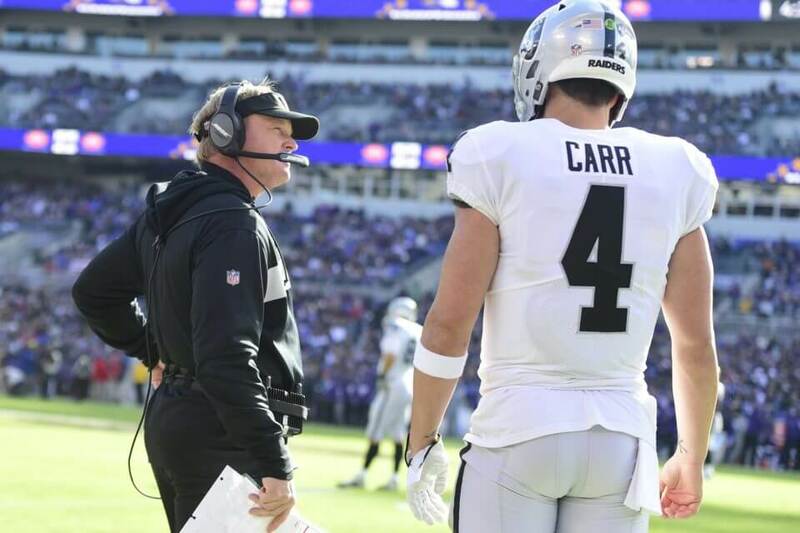 Of course, given our memory of the 2016 season, no one imagined it would look as ugly as it did for the first five weeks of the season — but now, with a noticeable turnaround in view and a greater understanding of the big picture, I think our understanding of Carr’s 2018 season needs to change. Despite all that has happened around him, Carr is on pace to throw for more yards, with a higher completion percentage and with a greater efficiency than he has in any other season in his career. Just think about that. The idea that the Raiders would consider moving on from Carr is getting more and more ridiculous by the day. (Not to mention the folks who forget how difficult it is to find an even average NFL quarterback in the NFL Draft — if you’ve forgotten, go Google the Cleveland Browns’ history of starting quarterbacks). Obviously, the 2018 Raiders season has been an unmitigated disaster no matter how you look at it — they’ve lacked energy and effort at times, they’ve seemed like a group without a plan and the bevy of transactions have been head-scratching at best. But despite all that, the last seven games have given the Raiders perhaps the best news they could have hoped for: they’ve still got a quarterback they can trust. While he may not be a Hall-of-Famer one day, I’m becoming more and more comfortable in saying that he’s a guy you can win with once this rebuild’s over with.